My review of the film The Thief Lord , which originally appeared in the now-gone May 2006 issue of The Edge of the Forest. had been released straight to DVD. This is usually a sign that the movie stinks. The Thief Lord remains my favorite of Funke's books, so it was with no small amount of fear that I sat down to watch the DVD. It helped that it's been over two years since I read The Thief Lord, so I had few instances of "that wasn't in the book" or "how could they have left out such and such." My first thought was relief; the young actors playing Prosper, Bo, the Thief Lord and the other children are perfect. The movie was filmed on location in Venice, and the city, with its mix of old and new and with hints of magic everywhere, was beautifully captured. Readers who loved the book will enjoy this film; and viewers who didn't read the book will have no problem following the story. The film captures the essence of the book: Brothers Prosper and Bo escape the selfish aunt and uncle who send Prosper to an orphanage while keeping the adorable younger brother. Once in Venice, the boys are happy to be together but have run out of money. Luckily for them, they meet the mysterious Thief Lord, Scipio, who looks after them along with several other homeless children. 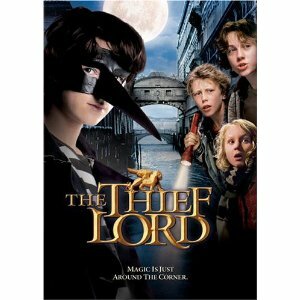 The Thief Lord is infamous, and has been hired to steal a valuable object; the reward would keep his adopted family safe. But the boys' aunt and uncle are hot on their tale and Venice is no longer safe. In the book, magical realism didn't appear until the end; in the movie, from the start Bo sees things that others don't, letting the viewer know that this isn't just another runaway movie. For the most part, the special effects worked well; but, particularly towards the end, there were a few things that fell flat. (Having adult voices come out of children's sized bodies, for example; and Scipio's horrible hair in the final scenes.) It was also funny how things on the page fell a wee bit flat on the book; the first time The Thief Lord is addressed as "Scip" it sounds like "Skip" the ultimate preppy name. It makes the Thief Lord look silly, rather than cool. The other children – Hornet, Riccio, and Mosca – were great, but because of the time limitations of film their characters were not fully developed. I was most disappointed in Hornet, or rather, the lack of screen time for Hornet. There are books around, and we do see Hornet reading a book (which IMDB says is Funke's own Inkheart!) but I think more could have been done to show Hornet and her books. And the movie reveals to the viewer Scipio's dual identity sooner than the book did. I would have loved, loved, loved this movie as a child. It's the same vein as "kids on their own" movies that I adored: Bugsy Malone, Flight of the Doves, Oliver!, Seven Alone. I'm not quite sure why this wasn’t released in the theatres. It's a nicely done family film; but the cast, while good, is largely unknown. As mentioned above, the special effects at the end are a little flat, especially for audiences used to Harry Potter and Chronicles of Narnia. In New Zealand, "Inkheart" went straight to DVD as well. I think this is a terrible thing to do, I really enjoyed both films. I try to recommend Cornelia Funke whenever I can. I guess it's distributors only backing the big films with guaranteed big returns? Thanks for reposting this, Liz. You reminded me that I never saw this movie. I added it to my NetFlix queue. It's neat that you mentioned Flight of the Doves - I thought of it while reading your plot summary. I never saw the movie, but I adored the book. And speaking of my NetFlix queue, I'm watching My So Called Life right now, something I've had in mind since seeing you talk about it a while back. Thanks for continuing to be "my Oprah".